As the modern world becomes increasingly sophisticated and mechanised, we grow further removed from the way things are made and how things are done - from the miraculous feats of engineering which underpin life in the 21st Century. Hanger 1 contains a vast archive of over 70,000 files of UFO reports collected by the Mutual UFO Network for nearly 50 years. MUFON is the most respected private organization devoted to the investigation of UFO reports. 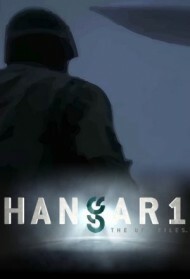 Hanger 1: The UFO Files will reveal some of the files and look for patterns and connections between some of the reports. Season 2, Episode 12 - "UFO Superpowers"
Season 2, Episode 11 - "Extreme Close Encounters"
Season 2, Episode 10 - "Captured Aliens"
Season 2, Episode 9 - "Cops vs. UFOs"
Season 2, Episode 8 - "The Smoking Gun"
Season 2, Episode 7 - "UFOs over Texas"
Season 2, Episode 6 - "Hunted by UFOs"
Season 2, Episode 5 - "Star People"
Season 2, Episode 4 - "The Far Side of the Moon"
Season 2, Episode 3 - "Men in Black"
Season 2, Episode 2 - "Underwater UFOs"
Season 2, Episode 1 - "UFOs at War"
Season 1, Episode 8 - "Shadow Government"
Season 1, Episode 7 - "Unfriendly Skies"
Season 1, Episode 6 - "Space Weapons"
Season 1, Episode 5 - "American Hotspots"
Season 1, Episode 4 - "Crashes and Cover-Ups"
Season 1, Episode 3 - "Alien Technology"
Season 1, Episode 2 - "Underground Bases"
Season 1, Episode 1 - "Presidential Encounters"